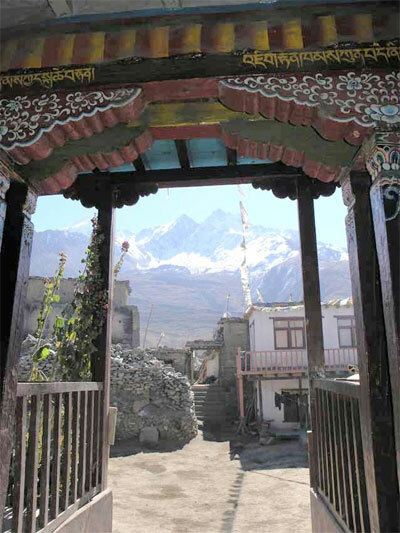 Last Trek Report – Kali Gandaki, October/November 2008 - Trekking in Nepal with Teresa, Slow Trekking for peoples of all ages. The ‘official’ start was the next day, 31 October, when the Nelsons, John and Moira and their friend Alma arrived. They are from Cressy in Victoria. 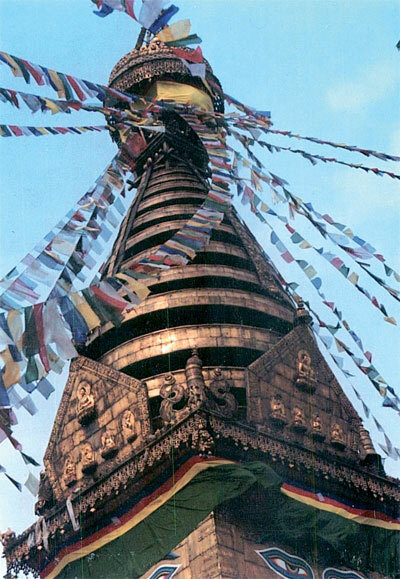 While Moira and Alma succumbed to jet-lag, John joined the rest for a walk round the Swayambunath kora circuit, culminating in a climb of 365 stairs to the stupa. Monkeys scattered in our wake as we took the easier road back to the BPD Monastery. A wall of sound was emanating from the gompa where our monks were doing ‘puja’, which involved a lot of Tibetan clarinets and heavy drumming. An early night for our travellers – we are now officially ‘a group’. On our first full day we strolled down to Thamel, the tourist district. Kathmandu is deteriorating quite badly these days. The roads are filthy and potholed. The river is a a sorry sight as fat pigs scavenge in the rubbish on the banks. Somehow it hangs together year after year. The ‘laissez-faire’ system of traffic control actually works and people are generally good-natured under very trying conditions. 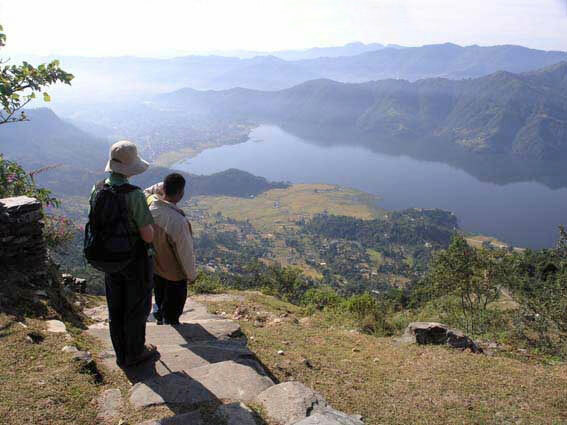 Our trekking gear shopping is generally done in Pokhara for this trek so we had a nice leisurely look around the city on Saturday. We took a slow walk through Durbar Square (where the pagoda form of architecture originated), Indra Chowk (richlycoloured fabrics hanging from everywhere), Assan Thole (the heady mix of spices, veggies, dried fish and incense) and Tahiti Th ole (dozens of cubby-hole shops selling Tibetan prayer artefacts and fabrics for monks). Some of us walked home – we are getting ready for trekking now. Our bus trip dragged a bit. There was a 2½ hour delay due to an accident up ahead. We were more than ready for the buff et at the Riverside Lodge when we got there at 2 pm. There was NO CLOUD at all on the way. The Annapurnas were on display, all afternoon. That was a first. We’d not long arrived when our good friends Des and Chris (from the previous trek) sang out hullo from their ‘tres posh’ hotel next door. They joined us for a drink and my good friend Liz was with us too. A regular dinner party! Early next morning everyone went down to the lake where Lahar and a friend paddled the boats across to the Peace Stupa. It’s only an hour to walk up but it’s the first taste of trekking and the weather was warm. It’s possibly a harder climb than any on the actual trek. They scored one of the clearest days of the season so far – a bit lucky. Our luck didn’t hold. The next morning was our flight to Jomsom. At 5 am it was raining. The flight was delayed, and delayed, and delayed. It eventually took off at 10.30 for a cloudy and extremely bumpy flight. Quite hard to keep smiling and play the guide whilst gripping the back of the seat in front. The pilot did a very steep banking turn upstream from Jomsom to land into the, by now, very strong, gusty wind. He put the plane down, just, to a rousing cheer from the very relieved passengers. Nilgiri was beautifully clear but the wind was howling in true Jomsom style. While Lahar flew up to Jomsom with us, the rest of our porters were waiting to carry our bags out of the airport. Udim, Suni, Khaji, Tham, Prem, Barat, Ram Kumar and Avi. What a great bunch of boys. It was a four-hour trudge into the wind to get to Tukuche. 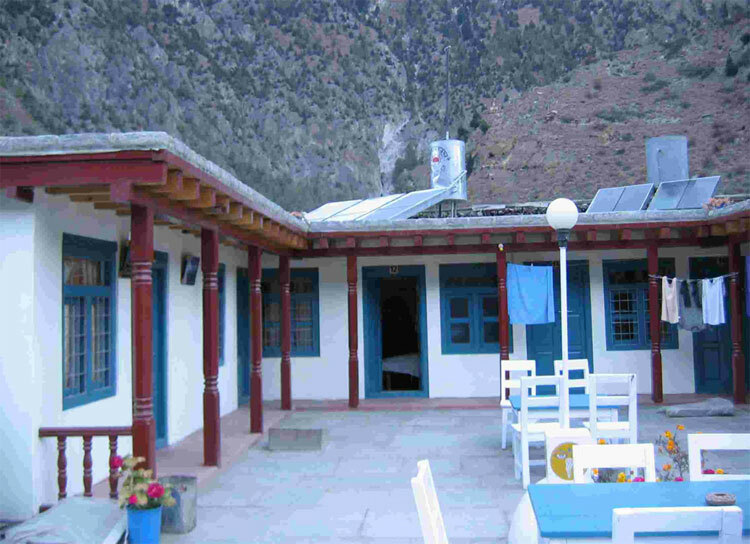 A long tea break at Marpha helped. With hats and jackets firmly clamped on we were tired and somewhat buff eted by the time we got to Tukuche. I felt as though I’d been in a tumble drier – a cold one. The lodge at Tukuche was so welcoming. Thelittle pine-lined rooms on the roof have all-around views and the ‘hot table’ was soon in operation. You have to sit at one of these tables to believe it. A little brazier of smokeless coal is put in a depression under the middle of the table and the big blanket over the table is snugged in around your lap while your legs are under the table – inside the warm. The group was starting to enjoy each other’s company and the stewed apple and custard was first rate. By morning the weather was perfect. We checked out the distillery in the morning, the boiler was fired up and most of us had a ‘little taste’. Both gompas were open so it was mid-morning before we headed back to Jomsom. Having crossed to the eastern bank shortly outside Tukuche we found the trekking really peaceful. Hardly any other trekkers and only a light breeze. After a couple of hours we arrived at the Chairo Tibetan refugee camp. Lots of tea and apples and shared packets of biscuits later we headed off for Marpha and a late lunch. Th is place has the best veggie noodle soup. It was nearly 4 by the time we climbed the gompa stairs to admire the layout of Marpha – so different from this rooft op perspective. 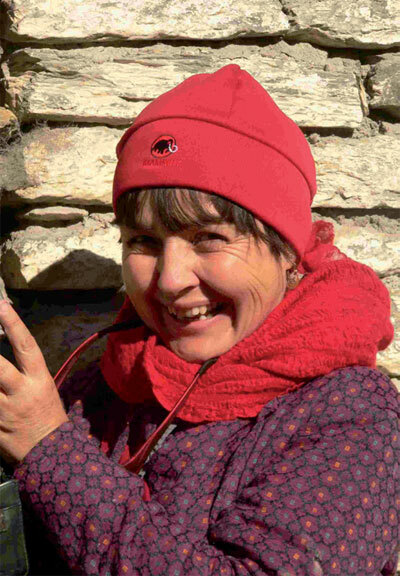 I took Barbera and Bronte up to Upper Shyang on the way back in to Jomsom – unable to catch up to the others. Dinner should have been around another hot table but the weather was so unusually warm we didn’t need it. A few Khukri rum-and-cokes did the trick. Attached bathrooms with hot water AGAIN tonight and Barbera is beginning to wonder what kind of ‘soft trekking’ this is. I even had a shower myself - on Day 2 of the trek. Unheard of. The walk to Kagbeni was really quite hot at times and we were parched and in need of a cuppa by the time we reached Eklai Bhatti. The afternoon breeze sprang up after that but it was only another 45 minutes into Kagbeni. A quick lunch gave us time to visit Tiri in Upper Mustang. The trail is as thin as ever. Barely there in places. 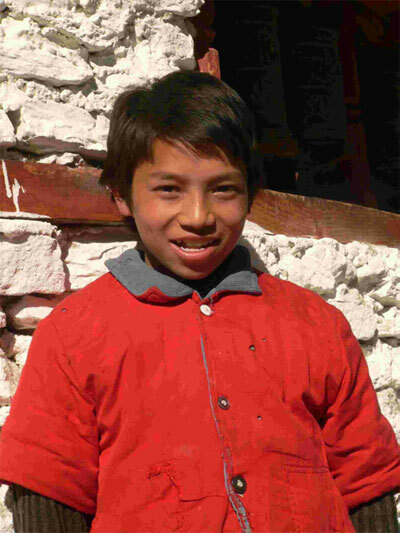 We defi nitely needed the porters to hand us across the slippery scree section. Pema’s hospitality was a lovely reward. Th is walk never disappoints. John had hurt his back though and planned to stay down in Kagbeni tomorrow. There was dancing to Khaji’s music, with all the porters singing and clapping in the kitchen after lights out. There were monks chanting in the puja room next day, with the usual accompaniment of bells and drums and Tibetan clarinets. The sound echoed around the halls for hours – luckily it stopped well short of bedtime. Next morning dawned really bright and clear and John’s back was OK after all. The horses behaved well so everyone relaxed and enjoyed the scenery instead of puffing and panting up the long climb to Muktinath. The Royal Mustang was full up so Th am, our runner for the day, got us digs at the North Pole. It wasn’t too bad. A bit gloomy but the food was good. The afternoon saw us walking up to the Hindu temple, then climbing up behind it for a closer look at the Th orong La pass. Then myself, Barbera, Sin Pin and Bronte visited the little ani gompa which houses the sacred rock where fl ame and water emerge from the earth in the same place. 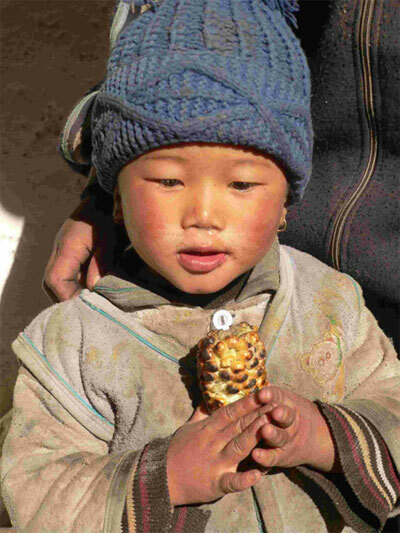 The smell of gas, which is the source of the fl ame, pervades the air in the tiny gompa. The Buddha statue here always touches me with his expression of serenity and boundless compassion. We were all in high spirits as we descended to Rani ‘bloody’ Pawa; even the Tibetan refugees with their relentless wheedling ‘why you no look?’ and ‘you buy one scaff, yes’ didn’t annoy me at all today. The stars were close enough to touch that night. Our descent back down to Kagbeni was a magic day. Very little wind and quite hot in the sun so we really lolly-gagged. The Jharkot village and gompa were explored and followed by a nice cuppa at the New Plaza Hotel (not to be confused with the original Plaza which, I think, has electricity). Siobhan, Allison and Sin Pin got so far ahead of us we decided to hang back and have our lunch at the Blue Sheep. The usual crop of three-metre high marijuana plants shaded the tables while we ate the best veggie noodle soup of the season – it must have been good because our porters had the same. We had a last look around the crumbling ruins (mostly still inhabited) of Kagbeni in the fading evening light and visited yet another 500-year-old gompa. For the return journey to Jomsom John, Moira, Alma and Alison opted for more pony riding. Thegroup stayed at the Majesty lodge this time. Nice rooms, clean bathrooms (mostly attached) but the service just isn’t as friendly as our regular haunt, the Marco Polo which was full. Next time! Great flight back to Jomsom. We took off in a northerly direction and did a huge banking turn over the interesting little villages between Jomsom and Kagbeni. The Annapurnas and Daulaghiri were at their sparkling best but a wreath of ragged clouds hung over the Phewa Lake. Mon Kumar and Sanu welcomed us back as if we’d been to the war. A huge and delicious breakfast was consumed on the terrace with a very large pot of real coff ee. It was good to be reunited with one’s remaining clean clothes. Myself and some of the ‘girls’ hit the clothes shopping fairly hard in the afternoon with mixed results. Mangal joined us for Sanu’s magnifi cent dal bhat banquet in the evening. The tree tomato (tamarillo) chutney was sensational. Next day saw most of the team taxi up to the bottom of the Sarankot peak for the early-morning climb. They had a really clear day for the view and enjoyed (well, mostly) their ‘jungle-bash’ return journey as Lahar had discovered there was a good trail back to Seti, just a couple of kilometres around the headland from Lakeside. There were a few fl ashy clothes in evidence at dinner - Barbera’s easily the best (peacock and hot pink with A LOT of glitter). We had dinner at the Mira for a change. It’s a pretty little courtyard and the Paneer Butter Masala could not be beaten. Thereturn bus trip went smoothly, so we only arrived in Kathmandu one hour late. Absolutely dog-tired we had dinner at home at the BPD. Next morning our own little minibus whisked us off to Boda Stupa. after a couple of laps, lots of pictures and a really good cappuccino we re-boarded the bus for Nagarkot. The Sunrise Hotel WAS great but, under new management and with a party of about 100 Indian students about to descend on the hotel for a hot buff et supper, the service level at dinner was less than inspiring. ‘Fawlty Towers’ was mentioned. There was a huge full moon but, unfortunately no peaks to view in the morning. Setting off after a rather leisurely start (is there any other kind in Nepal? ), we descended through steeply terraced farms. It was charming. Millet was ready to harvest. Lowland buckwheat with its pink blossom and mustard seed with its yellow blossom adorned the little curving fi elds. We passed clusters of adobe houses with their classic blue windows, gardens bursting with marigolds. We climbed over a ridge of whispering pines and then down to the ancient (World Heritage Listed) temple at Changu Narayan for a well-overdue lunch. It was then a slow grind through smog and traffi c but we were still up for a ‘last supper’ at the Weizen. John fi nally got some meat (roast pork chops) and Sin Pin too (steak chateau-briand) but they were overshadowed by the salads which were almost too pretty to eat. Our taxi drivers seemed to be racing each other home which was rather exciting. Sad to break up today, such a good group. I think some of us will defi nitely be catching up with each other in Melbourne this summer. Sin Pin headed off to Singapore to visit family. Siobhan went back to the Barossa and her sister Alison back to Castlemaine. John and Moira had a few more days but they will soon be back on the farm at Cressy, just out of town from Alma (Ama). ‘Princess Barbera’ was staying on for the third trek (trifecta for her) and Bronte is heading back to Melbourne with an open agenda. Bye folks, it’s been a lot of fun. 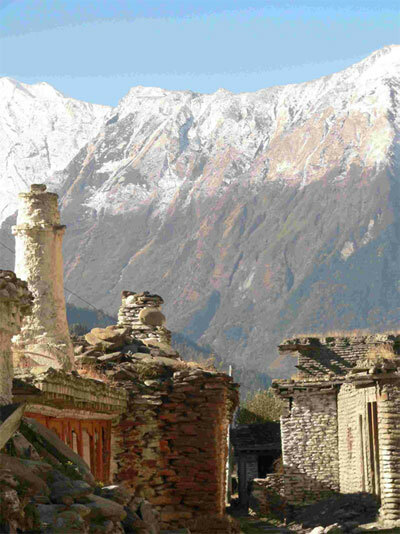 Our next Kali Gandaki trek will run again from March 17 to April 2, 2009. The price was advertised at $1950 but I am seeking an extra $200 on top to make up for the atrocious exchange rate on the Aussie dollar at the moment. There are places available as I write. Please ring me at home in Woodend on 03 9315 9617 or email me at teresadidi@slowtrekking.com or vonschwichtenberg@gmail.com, teresadidi@slowtrekking.com . Keep your eye on the website at www.slowtrekking. com for more information and updates. Acknowledgements: Frank Jones, Desktop Dynamics, Geelong (editing & layout); Ian Dobson, Qld. (some of the pics).